Howard Hanson was born in the very heartland of the United States, Wahoo, Nebraska, on October 28th, 1896. His parents emigrated from Sweden to America when they were young and his Scandinavian roots played a very important role in Hanson’s aesthetic and spiritual make-up. Taught music first by his mother, he determined on a career in music and began his formal musical education at Luther College in his hometown. He continued his studies at the Institute of Musical Art under Percy Goetschius and at Northwestern University, in Evanston, Illinois, under P. C. Lutkin and Arne Oldberg where he also served as an instructor in 1915-16. After graduation he taught theory and composition at the College of the Pacific in San Jose, California where he became Dean of the Conservatory of Fine Arts in 1919. His first major success as a composer came in 1921 when he was awarded the first American Prix de Rome in Music from his California Forest Play of 1920 for solo voices, chorus, dancers, and orchestra. In a far reaching move that was to have a decisive effect on music education in the United States, George Eastman chose the young Hanson to be director of the recently founded Eastman School of Music in Rochester, NY, in 1924. Hanson was to head the school for 40 years until his retirement in 1964, making Eastman one of the most influential music conservatories in the world, by broadening its curriculum and raising the standards of its orchestra, the Eastman Philharmonic, to a near professional level. In 1925, he began a series of orchestral concerts that was to serve as a major showcase for the music of American composers, especially those associated with the Eastman School of Music. Called the “American Music Festivals,” these concerts introduced the music of many composers who have become well-known, including Ronald Lo Presti, Bernard Rogers, Peter Mennin, Gardner Read, David Diamond, Kent Kennan and John La Montaine. During his years at Eastman, Hanson continued to compose and conduct throughout the world, and his programs invariably included the music of American composers. Landmarks of his career as a composer include the Symphony No. 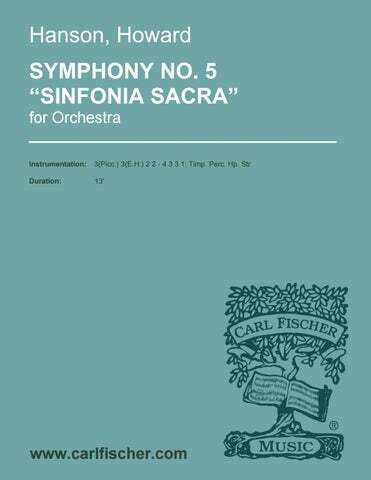 1 (Nordic), which he first performed in Rome on May 20, 1923; Symphony No. 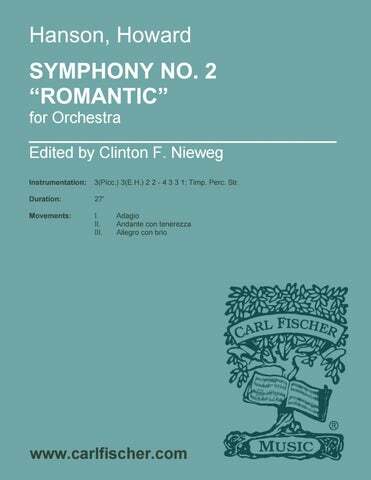 2 (Romantic), commissioned for the 50th anniversary of the Boston Symphony Orchestra and premiered by them under Serge Koussevitzky on November 28, 1930; the three-act opera, Merry Mount, commissioned by the Metropolitan Opera and first presented there on February 10, 1934; and Symphony No. 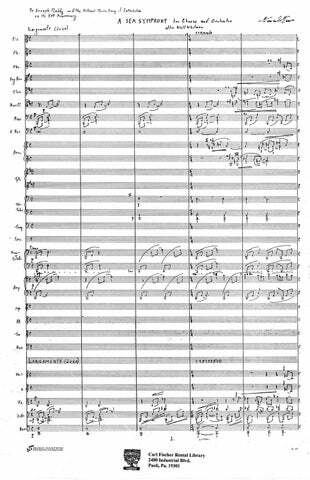 4 (Requiem), which Hanson conducted with the Boston Symphony Orchestra on December 3, 1943, and which won the 1944 Pulitzer Prize. As a composer of choral music, Hanson enriched that repertoire with several of the most popular works for chorus and orchestra by an American composer, including Lament for Beowulf (1926), 3 songs from “Drum Taps” (poetry by Walt Whitman) (1935), The Cherubic Hymn and Song of Democracy (Walt Whitman) (1957). In 1935, Hanson was elected to membership in the National Institute of Arts and Letters, and in 1938, he became a Fellow of the Royal Academy of Music in Sweden. At various times, his concern for the musical education of the young led him to become involved with important national organizations, among them the National Association of Schools of Music, the Music Teachers National Association (both of which he served as President) and the Music Educator National Conference. He was also a founder and President for many years of the National Music Council. Hanson’s music, avowedly neo-romantic, shows the influence of his Scandinavian background – he cited Grieg and Sibelius as the inspiration for his lyrical and harmonic style. 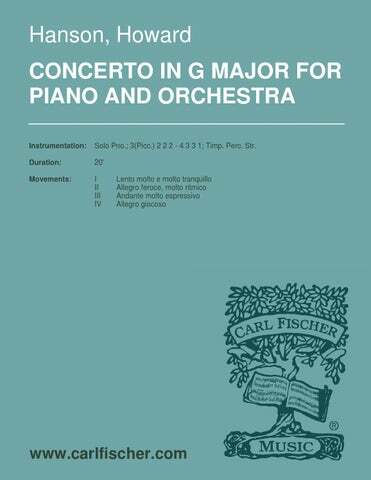 His studies in Rome with Respighi undoubtedly enhanced the effectiveness and brilliance of his instrumental writing. Never an extremist, Hanson’s harmonic palette is often enriched with bitonal and modal writing, and his music shows a marked fondness for asymmetrical rhythms of great vitality. Always fascinated by Gregorian Chant, he frequently uses that style as a source for his melodic shapes and often quotes chorales, or re-imagines the choral style in his music as well. His music, inflected with colorful orchestration and possessed of a wide emotional range from the somber and pungent writing found in the symphonies to the gaiety and vivacity of the delightful Serenade for flute, harp and strings, is a characteristically American style that proved deeply influential on the music of several generations of American composers. Hanson’s influence as a composer, conductor, educator and administrator is a considerable and abiding testament to his greatness and his importance to every area of American musical life. 4:00 3(Picc.) 2 2 2 – 4 2 3 1; Timp. Str. 28:00 4(Picc.) 3 2 2 – 4 3 3 1; Timp. Perc. Pno. (or Cel.) Hp. Str. 13:00 3(Picc.) 2 2 2 – 4 3 3 1; Timp. Hp. Str. (Introduction, Chorale, Variations and Finale) 12:00 3(Picc.) 3(E.H.) 3(B.Cl.) 3(Cbsn.) – 4 3 3 1; Timp. Perc. Str. 14:00 2 2 2 2 – 4 3 3 1; Timp. Perc. Hp. Str. 16:00 2(dbl. Picc.) 2 2 2 – 2 0 0 0; Perc. Pno. Hp. Str. Prelude and Ballet 1 1 2 1 – 2 0 0 0; Timp. Perc. Str. 15:00 Solo Vln. ; 3(Picc.) 2 2 3(Cbsn.) – 4 2 3 1; Timp. Perc. 2Hp. str. 13:00 3(dbl. Picc.) 3(E.H.) 3(B.Cl.) 3(Cbsn.) – 4 3 3 1; Timp. Cel. Hp. Str. 12:00 Solo clarinet and bassoon; 0 0 1 0 – 2 2 0 0; Hp. Str..
11:00 3(Picc.) 3(E.H.) 2 3(Cbsn.) – 4 3 3 1; Timp. Perc. Pno. Str. 6:00 Solo Ob. ; Hp. Str. 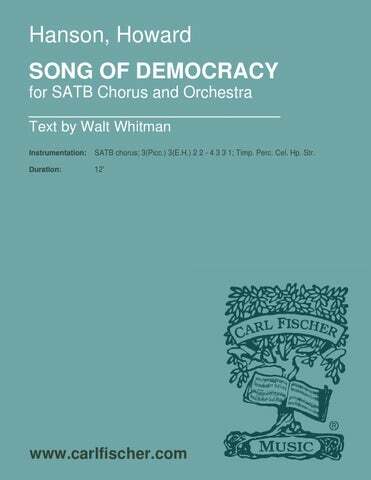 for Chorus and Orchestra 17:00 SATB chorus; 3(Picc.) 3(E.H.) 3(B.Cl.) 3(Cbsn.) – 4 3 3 1; Timp. Perc. Pno. Hp. Str. 28:00 3(Picc.) 2 2 3(Cbsn.) – 4 2 3 1; Timp. Perc. Hp. Str. 6:00 3(Picc.) 2 2 3(Cbsn.) – 4 2 3 1; Timp. Hp. Str. Classic Eastman Edition 27:00 3(Picc.) 3(E.H.) 2 2 – 4 3 3 1; Timp. Perc. Str. Philadelphia Orchestra Critical Edition 27:00 3(Picc.) 3(E.H.) 2 2 – 4 3 3 1; Timp. 3Perc. Hp. Str. 35:00 3(Picc.) 3(E.H.) 3(B.Cl.) 3(Cbsn.) – 4 3 3 1; Timp. Str. 8:00 3(Picc.) 3(E.H.) 3(B.Cl.) 3(Cbsn.) – 4 3 3 1; Timp. Str. 22:00 3(Picc.) 2 2 3(Cbsn.) – 4 2 3 1; Timp. Perc. Hp. Str. 13:00 3(Picc.) 3(E.H.) 2 2 – 4 3 3 1; Timp. Perc. Hp. Str. 20:00 picc./2/2/eng.hn./2/cbn. – 4 3 3 1; Timp. Perc. Str. 6:00 picc., fl. (2), ob. (2), eng.hn., cl. (3), bsn. (2), cbsn. ; hn. (4), tpt. (3), tbn. (3), tba. ; timp., perc. for Band 15:00 Picc., 2Fl., 2Ob., E.H., Eb Cl., 4Cl., A.Cl., B.Cl., 2Bsn., Cbsn., 2A.Sax., T.Sax., Bar.Sax. – 3Cnt., 3Tpt., 4Hn., 3Tbn., Bar., B.Bar., Tu. ; Timp. Perc. for Band 8:00 picc., fl. (2), ob. (2), eng.hn., Eb cl., cl. (3), a.cl., b.cl., cb.cl., bsn. (2), a.sax. (2), t.sax., b.sax. ; hn. (4), cor. (3), tpt. (2), tbn. (4), bar.hn., tba. ; cb., timp., perc., hp. 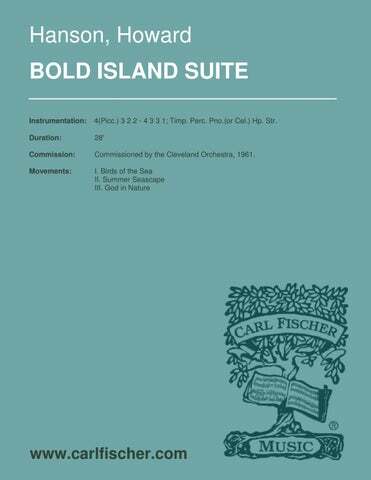 Version for Chorus and Band 17:00 SATB chorus; picc., fl. (2), ob. (2), eng.hn., Eb cl., cl. (3), a.cl., b.cl., bsn. (2), cbsn. a.sax., t.sax., b.sax. ; hn. (4), tpt. (3), tbn. (3), bar.hn., tba. ; timp., perc. (2), pno., hp. 1:00 fl. (2), ob. (2), cl. (4), a.cl., b.cl., bsn. (2), a.sax. (2), t.sax. (2), b.sax. ; hn., bar.hn., tba. ; cb., timp., hp. 6:00 picc., fl. (2), ob. (2), Eb cl., cl. (3), a.cl., b.cl., bsn. (2), a.sax. (2), t.sax., b.sax. ; hn. (4), tpt. (3), tbn. (3), bar.hn., tba. ; timp., hp. 27:00 Solo piano; picc., fl. (2), ob. (2), eng.hn., cl. (2), b.cl., bsn. (2), cbsn. ; hn. (4), tpt. (3), tbn. (3), t.; timp., perc. 15:00 Solo organ, harp; str. 20:00 Solo Pno. ; 3(Picc.) 2 2 2 – 4 3 3 1; Timp. Perc. Str. 12:00 SATB chorus; 3(Picc.) 2 2 3(Cbsn.) – 4 2 3 1; Timp. Perc. Pno. Str. 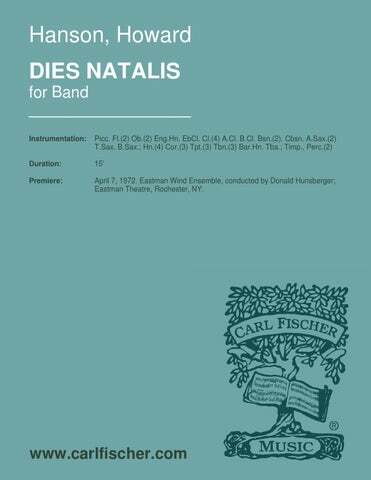 4:00 SATB chorus; 3(dbl. Picc.) 2 2 2 – 4 3 3 1; Timp. Perc. Hp. Str. 19:00 SATB chorus; 3(Picc.) 2 2 2 – 4 3 3 1; Timp. Perc. 2Hp. Str. 21:00 SSAA chorus; 2 2 2 2 – 2 2 2 0; Timp. Perc. Pno. Hp. Str. 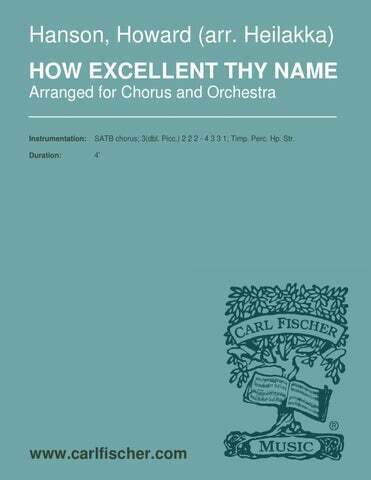 16:00 Narrator; SATB chorus; 3(Picc.) 3(E.H.) 2 3(Cbsn.) – 4 3 3 1; Timp. Perc. Pno. Hp. Str. 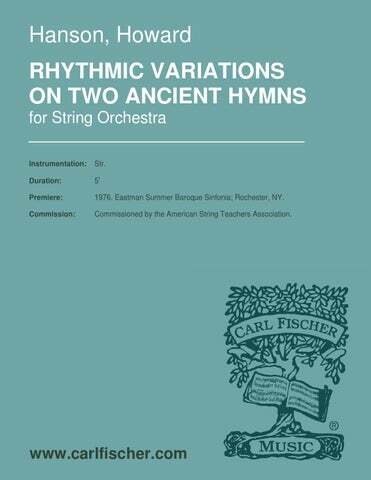 1:10:00 Solo soprano, bass voices; narrator; SATB chorus; children’s chorus (opt. ); 3(Picc.) 2 2 2 – 4 3 3 1; Timp. Perc. Str. 4:00 Solo voice; SATB chorus; 3(Picc.) 2 2 2 – 4 3 3 1; Timp. Str. 5:00 SATB chorus; 3(Picc.) 2 2 2 – 4 3 3 1; Timp. Perc. Str. 12:00 SATB chorus; 3(Picc.) 3(E.H.) 2 2 – 4 3 3 1; Timp. Perc. Cel. Hp. Str. For Mixed Chorus and Band 12:00 3(Picc.) 2 3(E.H.) 7(E.Cl. A.Cl. B.Cl.) 3(Cbsn.) 3A.Sax. 3T.Sax. 3B.Sax. – 4 3 3 BaritoneTC BaritoneBC 1; StrBass. Timp. Perc. Cel. Hp. 12:00 SATB chorus; 1(Picc.) 2 2 2 – 4 3 3 1; Timp. Perc. Str. 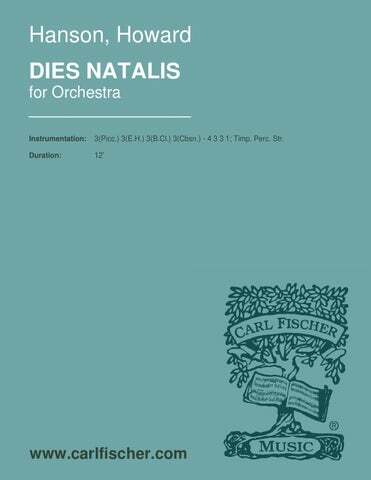 12:00 SATB chorus; picc./2/2/2/cbn. – 4 3 3 1; Timp. Perc. Str. 9:00 Solo medium voice; SATB chorus; 1(Picc.) 2 2 2 – 4 3 3 1; Timp. Str. 6:00 Solo flute; Hp. Str. (Wind Setting) 6:00 Solo flute, harp; picc., fl. (2), ob. (2), eng.hn., cl. (4), b.cl., cb.cl., bsn. (2), cbsn. ; hn. (2), tpt. (2); glsp., vib., cel. 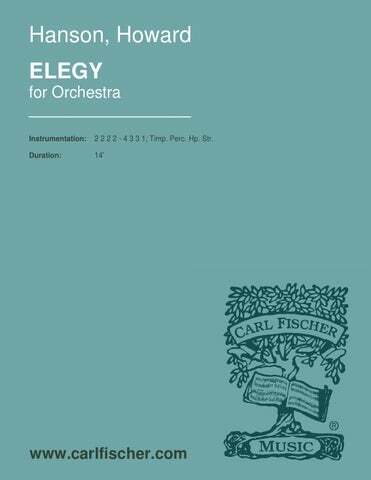 …[a] lavishly melodic solo line set against a constantly colorful orchestral accompaniment.